Do you know that guest blogging is now the best way to market your web content and enhance your online following? However, traditional guest blogging simply does not work. It can take forever to publish just one article on another website. Ultimate Guest Blogger seamlessly connects guest bloggers and website owners to make guest blogging a snap! Here are just a few reasons that you need Ultimate Guest Blogger. Best Promotional Tool: Publishing your ideas on many different websites is the best way to gain exposure for your online content and identity. One Account: One account with us gets you access to all websites and blogs. Best Inbound Links: You can get do-follow, contextual links in your articles. Articles Published Quickly: Your articles are reviewed and published quickly. Signup For a Free Trial Now! Web Site Owners: Accept Guest Posts In Less Than 5 Minutes! Would you like to easily accept guest posts on your website? At Ultimate Guest Blogger, we have an easy, free, and very powerful solution for accepting guest posts on your WordPress website/blog. Visitor Involvement: Allow your readers to get involved and post articles on your site. Enhance Web Site Exposure: Users of Ultimate Guest Blogger will now see, visit, and provide content for your blog. Fresh Content: Your Guest Posters provide new, ever-changing content and perspectives to your blog/website. Signup For a Free Blog Owner Account Now! Ultimate Guest Blogger is the best marketing solution for your website and online presence. By writing quality content and publishing as a guest poster on many websites, you are able to build diverse inbound links, often with the anchor text of your choosing, enhancing your online reputation and improving your placement in the search engines and social media outlets. Do you know that most of what you have heard about marketing your website is wrong? It didn’t use to be wrong…but it is now. Most people are spending time following old marketing methodologies, like article marketing, that no longer work in 2013. Why do they no longer work? What happened? In early 2011, Google began a massive rollout of their new search algorithm–lableled “Google Panda”–in an attempt to improve the quality of their search results. This algorithm destroyed the effectiveness of many traditional methods of website marketing. The sites that were hit the hardest by Google Panda were sites that many people used for marketing, like article directories such as eZinearticles.com and articlesbase.com. These article sites were once a quick and efficient way to achieve quality, inbound links, often with the anchor text of your choosing. This is no longer the case. Article directories have been declared by Google to be inconsequential and filled with shallow content. As you may have read, guest blogging has become one of the hot new ways to market your website. However, guest blogging normally takes even more time than article marketing and is riddled with complications, which begin immediately. First, you have to find a quality website that would be willing to host content that you have written. You then have to contact that website to find out if they would be willing to publish an article written by you. Then, you have to negotiate the subject matter of that article. Finally, you have to write the article, which may or may not be accepted. And what do you get for all of these efforts, which could take weeks? Perhaps one inbound link? Finally, there is a solution to all of these problems presented by traditional article marketing and guest blogging. The solution is Ultimate Guest Blogger, the perfect guest posting solution. Ultimate Guest Blogger solves all the problems associated with article marketing and guest posting. It provides an extremely easy way for you to publish articles on high-quality websites with inbound links of your choosing. There are so many problems that Ultimate Guest Blogger solves that it is difficult to narrow down the list. However, see below to learn the 9 reasons that you should start Ultimate Guest Blogger today. For years, I have used article marketing as the cornerstone of my SEO strategy. After Google Panda, this is not effective. Now, I publish all of my articles on Ultimate Guest Blogger, which is more effective and much less time consuming! After the release of Google Panda, I noticed a decrease in Google rankings for our sites. Now that I have been doing marketing via Ultimate Guest Blogger, our pages are coming back strong to the top of the rankings! Sign up for our monthly newsletter to receive updates, news, and interesting tidbits about Guest Blogging. With Ultimate Guest Blogger, we have done all of the account setups for you. You can begin publishing your articles immediately, which saves a drastic amount of time and logistical headaches. Whether you are trying guest blogging manually or still publishing to article directories, you know that approval can take days and is no longer guaranteed. With UGB, your article simply gets published. With article directories and other guest blogging, you are usually limited to footer links in a resource box. With UGB, you get the best type of inbound link: contextual links within the body of the article. You might say that this is the best guest blogging idea ever! You know that inbound links to your websites are heavily judged based on where they come from. With UGB, inbound links to your websites will come from sites with high root page rank, which boosts their value in the eyes of the search engines. Many links in article directories and on guest blogging sites don’t actually contribute to the value of your site because they only provide you with no-follow links. At UGB, we do our best to ensure that all of your links will be do-follow. We have made Ultimate Guest Blogger so easy to use that it is almost embarrassing. You no longer have to learn to navigate multiple websites looking for the areas that allow you to publish articles. UGB makes publishing your articles a snap! Ever tried to publish something on eZine and it took forever to get published? They requested rewrites and modifications which delayed the process even more. Well, with UGB, this does not happen. Your articles are published quickly! You can’t do this alone. UGB harnesses the power of many. If you create your own blogs , all of your links will go to a few sites–this is unnatural. With UGB, the collective efforts of all of our authors makes your links unique! Ultimate Guest Blogger gives you all of this for just one quarter a day! That loose change you have laying around? Now, you can have this amazing product for that extra quarter. Sign up now before the price goes up. EASY! That has been the goal from day one with Ultimate Guest Blogger. Easy publication of your articles and an easy payment structure. 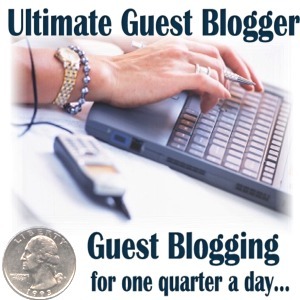 The price of Ultimate Guest Blogger is 25 cents a day annually. That’s it. One quarter. We accept payments through PayPal. Your price of .25 a day comes to $91.25 for one full year (be sure to read our no spamming policy below). You can begin publishing your articles immediately! Spammers, we don’t want you!!! Stay away. With an amazing solution like Ultimate Guest Blogger, you may be tempted to try to use Ultimate Guest Blogger to spam your links to our blogs. Don’t do it! We do not tolerate article spinners and spammers. Your articles will be deleted and your money will not be refunded. To prevent spammers, we have simple, but very important requirements. Articles must be 400 words or longer, unique, and beneficial to the reader. Articles can contain 2 of your links and 1 other, “important” link. You are allowed to publish 5 quality articles per day. We know that you’ll love Ultimate Guest Blogger and we welcome you to try it before you buy it. Taking Action! It is the only way to have success online. 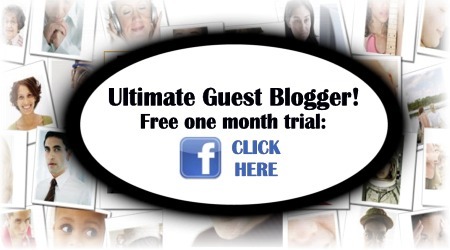 You have seen all of the great benefits of Ultimate Guest Blogger. And, yes, we have even given you the chance to try it out. Now, it is time to take action. Ultimate Guest Blogger is simply the best way to generate inbound links to your website with the anchor text of your choosing. There is no better solution. Right now, you can have Ultimate Guest Blogger for .25 a day. Enrollment is limited at this price. As we add members, features, and resources, the price will go up. But, right now, it’s a quarter a day. That’s it. Your price for high rankings. All payments are through PayPal, the most trusted authority online. We only offer subscriptions annually. Your price of one quarter a day comes to $91.25 for a whole year.